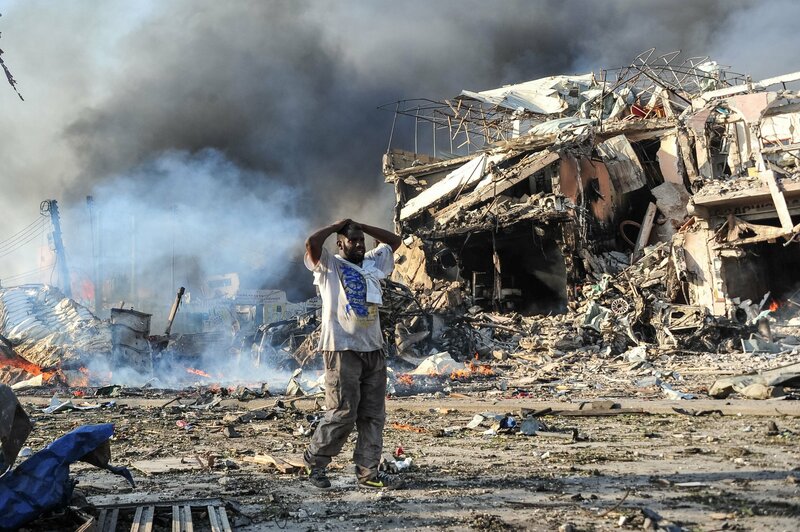 The U.S. sent humanitarian and medical aid to Somalia on Tuesday, just three days after a massive twin truck bombing turned into the deadliest attack in the African country's history. The quick assistance comes as many Americans believe the U.S. should be giving more to its citizens, including those in Hurricane Maria-ravaged Puerto Rico, instead of foreign governments. A top American diplomat of the U.S. Mission to Somalia called a charge d'affaires, "declared that this disaster meets the criteria to warrant immediate U.S. government assistance" due to large-scale damage, a spokesperson for the U.S. Africa Command told the Associated Press. That allowed a U.S. military plane to land in Somalia's capital, Mogadishu, with medical aid and humanitarian supplies so quickly after the bombing, which killed 300 people, injured nearly 400 others and left dozens missing. Meanwhile, the U.S. Department of Homeland Security's Federal Emergency Management Agency (FEMA) continues to help Puerto Rico several weeks after Hurricane Maria made landfall on September 20. To date, the road to recovery for the island is long, with its infrastructure destroyed and electricity shortages. "Clean water remains a top priority," FEMA tweeted on Tuesday. A new poll from the Kaiser Family Foundation found that 62 percent of Americans believe Puerto Rico is not getting the help its residents need because the federal government's response has been too slow. Three-quarters of the public are "aware most residents of Puerto Rico are U.S. citizens," the survey revealed. A March Rasmussen Reports national online and telephone survey found that 57 percent of likely American voters felt that the $42.4 billion in military and economic aid the U.S. earmarked to give to other countries this year is excessive, and only 6 percent said it was not enough. A Morning Consult/Politico survey, also conducted in March, showed that registered American voters across the board wanted to see the U.S. spend more on domestic programs especially in health care and education. Fifty-two percent favored cutting foreign military aid, while 45 supported cutting humanitarian assistance. Just over half of Americans surveyed by YouGov last year thought the U.S. gives too much in foreign aid, and only 9 percent thought the U.S. should contribute more to developing countries. Somalia's government blames the Saturday attack on the al-Shabab extremist group. The group, which has not commented on the attack, has for more than a decade engaged in warfare in Somalia, particularly in Mogadishu. The U.S. called the attack "cowardly," the AP reported. International aid for Mogadishu has ramped up quickly, as a medical crew from Djibouti, where the U.S. military has its regional hub, dispatched on Monday to take away the wounded. Kenya announced on Tuesday it would evacuate 31 injured people from Mogadishu for treatment in Nairobi and would send 11 tons of medication and supplies. The seaside city of Mogadishu is home to more than 2 million people who face an uphill battle in recovering from years of ongoing conflict.